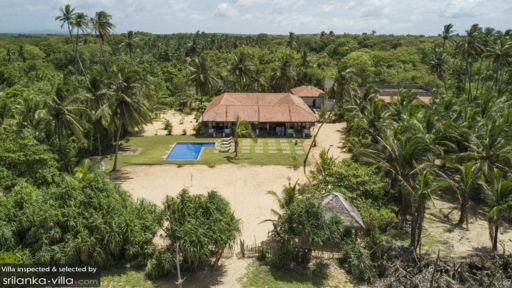 Tucked away to the proximity of the Indian Ocean, Aaloka Villa is a standalone beachfront haven in Sri Lanka! Completely silenced out from the noise of traffic, guests are spoiled with sounds of rolling waves and unhampered ocean views. The 3-bedroom villa boasts a private seashore for guests to take strolls by the beach - to feel sand in their toes, whilst soaking underneath the golden sun. 3 suites are fully-furnished within the beachfront home - with either king beds or twin bunk beds, guests have the variety fit for kids as well! It is complete with rustic stone flooring, a thatched roof colonial-style, and its own staircase descending straight to the lush gardens. The master is furnished with a king-sized four poster bed wrapped in pure white drapes. All the suites have floor-to-glass ceiling sliding doors to allow for a naturally sunlit room, as well as air-conditioning to cool the hottest tropical day. The en-suite bathroom complement the rustic aesthetic of the suite and hosts all necessary essentials suchlike twin vanities, a closet space & rain-shower facilities. A 9-metre long pool sprawls across the manicured gardens of Aaloka Villa. As it’s aquamarine waters glisten beneath the tropical sun, guests can lounge about in sunloungers or shady terraces. Beside the pool is an alfresco hut with seating arrangements to nourish the ocean breeze. There and then, can guests feel the fresh lot of sand under their feet. The long colonial hallways welcome multiple living spaces. Nestling a wall of art pieces and a built-in couch faces, the villa sees a cozy section facing its own TV set and a chair-swing. With a spread of 8 chairs, the dining table is ready to host intimate dinner parties or poolside garden lunches. Overlooking the seaviews and panoramic horizon, with breezy palm trees, a garden party with friends and family isn’t too shabby! The dimly lit space is golden-toned and adorned in eclectic stone sculptures. An intimate kitchen is tucked away behind the central living. Fully-equipped with two countertops and an island in the center. Ovens, microwaves, toasters, pans, and cutleries are all ready for use. Fully-staffed Aaloka Villa does not skimp on five-star help. With gardeners, a pool attendant, and housekeeping services, guests will not need to worry about keeping the place at tip-top shape! A small extra charge is added if daily breakfast, laundry services, masseuse and babysitters are requested. 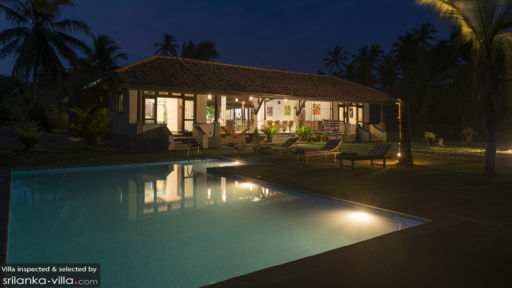 Neighbouring the Kahandamodara Beach, Aaloka Villa is short walk away from the coast. Scrumptious seafood from Cactus Lounge or Sha Sha Seafood is a ready for you to try. Spend an afternoon at the Turtle Watch in Rekawa Beach to see the turtles gently hide their eggs. A trip to Bandula Surfing School will grant guests with surfing lessons along the coasts of Tangalle! Perhaps go visit Zephyr Restaurant, where you can grab a cocktail or two! Allocate a day to pamper yourself at the famous Amangalla to enjoy refreshing detox scrubs or rejuvenating foot massages. The villa aaloka is a dream vila. We felt at home immediately thanks to the warm and welcoming staff. Facilities and the house are just amazing. We enjoyed the calm and the peace of the surrounding environment: the deserted beach, the sound of the sea and the birds waking you up. Our kids just loved it (we have 2 boys (10 and 7) and a little girl aged 2). It is a perfect holiday villa for 2 families. The food provided was excellent, nothing but good to report and I will certainly spread the word around my friends. We were two families in the villa and we felt welcome since the first moment that the staff welcomed us at the door. After a long trip from Colombo, we were immediately offered with a fresh coconut each. Amazing!! Our stay was incredibly pleasant and the food was simply divine, with so much flavor and spice levels to our liking. The calm moments at the pool, looking at the beach. We miss it! I wish we can go back to Aaloka Villa very soon. Thank you! Aaloka is truly a special family retreat in a beautiful southern province of Sri Lanka, close to Tangalle. Perfectly situated to access gorgeous beaches, mountains temples, and super cool Safari Parks. 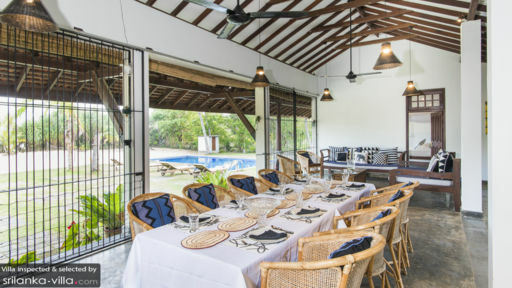 More than that it is a family beach house lovingly curated by an Australian/Sri Lankan family, supported by wonderful staff, amazing cooks and locals, constantly engaging with the local community in a positive way. Our family has returned many many times, each visit it becomes increasingly difficult to leave the amazing beachfront locale to go and explore new surf beaches, temples, wildlife parks, fishing expeditions to name only a few. Leopard spotting in Yalla Safari Park has become a family sport. I cannot recommend Aaloka Villa enough for families, young old or groups of friends. It is a wonderful place for fun and adventure or just a peaceful place to rest, we do both !! We stayed here in 2012 with our two young kids and had an amazing week just chilling out and enjoying this amazing property and the staff. Words cannot describe how good the food was. This is definitely the best food we have ever eaten on holidays. We ate everything from typical European dishes to great local Sri Lankan dishes all made from incredibly tasty fresh ingredients. Walking the beach is amazing and venturing out of the villa you really feel your back with nature. I highly recommend Aaloka to anyone looking to get away from the hustle and bustle, staying in a beautiful villa where you can really switch off and enjoy life! Me and my wife stayed 10 days in AAloka Villa and since the first day we arrived everything was excellent. Rahna, Hansi and Sameera made our stay one of the best in years. The house is located in an endless and empty beach where you won't find any tourist just you and if you like you can take Mickey and Mimi for a walk. The house is just great with a very nice design and anything you need just ask Rahna and she will provide. And what to say about the food, Hansi is a great cook better than any restaurant and the products are all natural not like in Europe. We did not want to go anywhere in ten days just one day to Yala Park. It´s the perfect escape from the world. Thanks to all of you. I was so lucky to be in this paradise many times. Since you arrive to the villa the welcome from the crew is like crossing into a new life: you feel so happy and relax that you can just think that your crazy ordinary life is now on stand-by mode for this holiday. The food is amazing the kindness is the life motif of the whole stay. The villa has everything, the furniture are gorgeous but simple, a jump into the pool is the best thing after a long walk on the beach. The surroundings are fab and running in the neighbourhood is so nice. The food is stunning, I never ever thought how good could be the Sri Lankan cousine, now I love it so much. And all are prepared with so much care for the details!! I also reccomend the visit to the Jalla Park and having Janika as driver as he is a guarantee to maybe spot the leopard... So yes I desperately will go back to Aaloka villa. Aaloka villa is gorgeous from the moment you open the front door you step into a huge open plan area which flows through the main living area to stunning views of the ocean and pool. The main living area is central with the kitchen, bedrooms and bathroom leading off it. The villa is very tastefully decorated to suit the gorgeous setting of Sri Lanka. And although it states it is self catered there is a wonderful manager/cook on site who does assist with shopping and cooking, she will host you to the local market to purchase fresh food, fruit and vegetables to whip up a delicious Sri Lankan feast to remember! There is lots to see and do in the local area which will keep you busy or you can just relax knowing you have the beach on your doorstep to soak up and explore. This was a great trip with two families travelling together to Sri Lanka - What an amazing and unique property. Staff were first class and food was fantastic. Beachfront was idyllic and felt like the beach belonged to us - people we did meet were friendly there was a real relaxed vibe. Yalla National Park was close enough to make it a simple day trip. I cannot wait to head back there. The house itself was amazing and ideal for families and groups - all the mod cons not that we looked at them just great days with great friends pool, beach... Amazing!